This scorpion which was discovered and described in 2011, Serradigitus miscionei, has just now been shown to reproduce by Parthenogenesis. It is the first Vaejovid scorpion shown to reproduce without mating. There are no known male Serradigitus miscionei. Parthenogenesis is rare. Only about 12 species of the thousands of scorpion species in the world reproduce in this manner. It is also the only Parthenogenetic species in North America. I am grateful to Robert Troup & Tom Miscione for their help in bringing this important discovery to the scientific community. Download the paper describing this discovery here. The Serradigitus miscionei photo above is a gravid female. Download the original species description here. 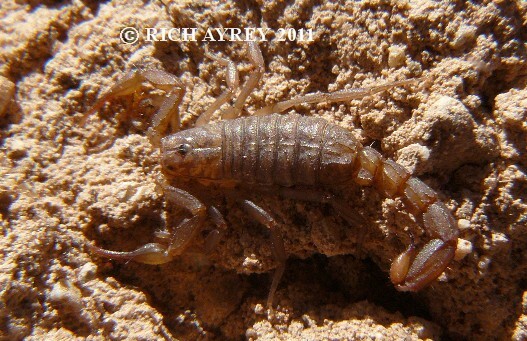 This Arizona Scorpion pic was taken in Southern Arizona in the habitat of Serradigitus miscionei. I am very fortunate to have pics of rare scorpions like this one. This Flagstaff Arizona Scorpion site copyright Rich Ayrey, 2011-2017. Arizona Scorpion World page created 02/01/2011. Arizona Scorpion World page last updated 02/27/2017.